Only two books have any marks, the name plate area has been written in. See pictures. These books have been read ONCE a year, during December. A long time before my son was born, I read an idea that I thought was FANTASTIC. Buy 25 Christmas Books and wrap them individually. Number them or stack them in the order you want to read them. Then, on December 1st, let your child unwrap one of the books and read it as a bedtime story. Repeat each night in December until you reach Christmas Eve when you will read TWO books, "The Night Before Christmas" and "The Christmas Story". What a wonderful December tradition! Alas, we've outgrown the activity, it is now time to find them a new home. Each of these books is in EXCELLENT condition (a tiny bit of expected wear on the covers) with the exception of two books, see pictures, that were purchased second hand with a name already written in the front cover. NO marks in the rest of the books. Some of these are special editions from the American Family Publishers. A picture shows the inside cover of one of these. Most of these retail (if you can find them, some are almost impossible to find now) for between $3 and $6. The listed price for this collection is a real bargain at only $2 each! 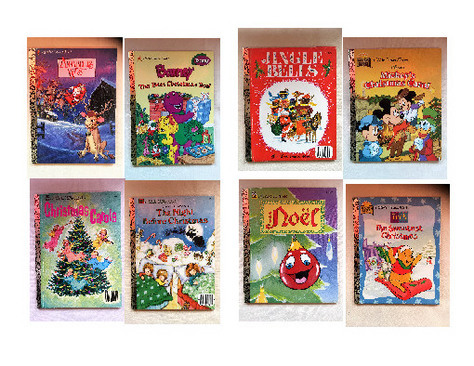 Buy them and start your own family December bedtime story tradition!